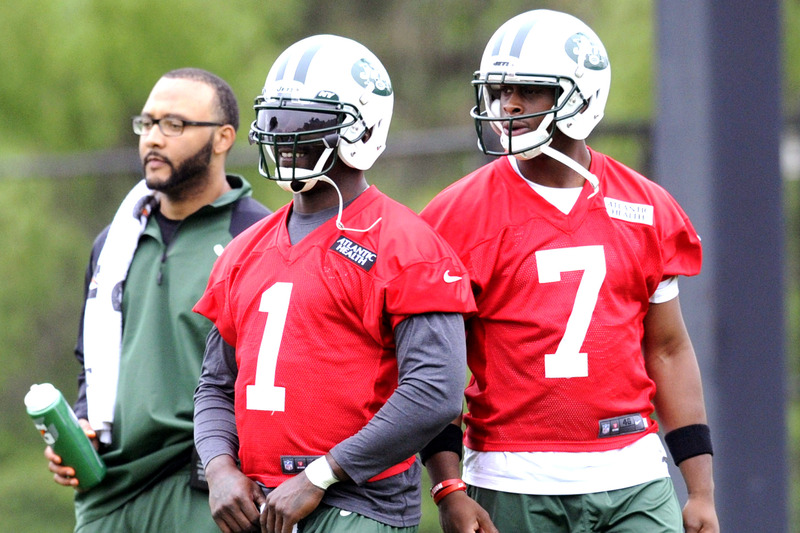 Michael Vick thinks that Geno Smith is the Jets starting quarterback. Rex Ryan thinks there is an open competition for the starting job. Geno Smith doesn’t want to talk about it. On only the second day of the off-season program the Jets have already managed to make a mockery of their quarterback situation — a yearly ritual at Florham Park. Since joining the New York Jets in the off-season, Vick has maintained that Smith is the Jets’ starting quarterback, and the pair aren’t in an open competition. The veteran drove home his feelings again on Wednesday when asked point blank if he thought the two were competing for the job. Geno Smith was not made available to the media on Wednesday, so didn’t comment. However, at this point, Smith is well trained in the John Idzik competition mantra so his answers would have been predictable. Despite what Vick thinks, and was apparently told when he signed, there is no doubt that he and Smith are in competition. Rex Ryan’s job is on the line this season, so if Vick gives the Jets the best chance to win, regardless of what he thinks, he will be the teams starting quarterback. If not, he is the perfect, compliant, backup quarterback.